It’s not enough to preach the Good News of Jesus Christ. If we don’t put the Word into action in our own lives it’s just empty words. 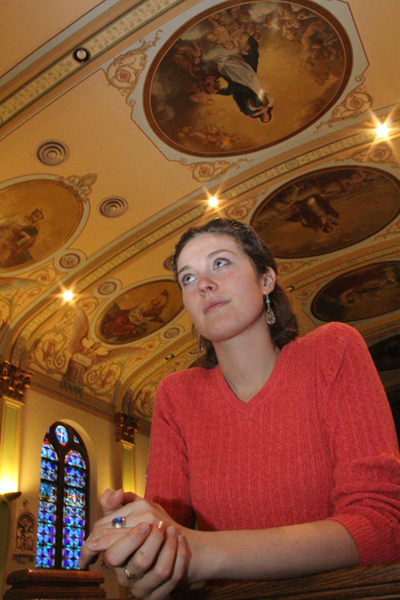 Olivia Sharkey, a senior at St. Vincent’s College in Latrobe, Pa., who is majoring in theology, preaches the Gospel by word and example. Every single year of her college career she has participated in service experiences or teaching among God’s poor in Central America and beyond. “Volunteer work has always been part of my family,” said Olivia, who grew up in St. Dominic Parish in Northeast Philadelphia and attended Nazareth Academy Grade School and High School, which she considered her second home and still proudly wears her class ring. When she was a young teen she would accompany her brother, Alexander, who is three years her senior on his food and companionship visits to an elderly couple as a volunteer with Aid For Friends. When Alexander left for college, she picked up the visitation by herself. “My parents (Timothy and Ramona Sharkey) instilled in us a desire to serve, to appreciate what we have and to give of what we have,” Olivia said. For college Olivia wanted to go away from home, but still have that same sense of community she found at Nazareth. Also, her goal was to ultimately become a high school theology teacher. 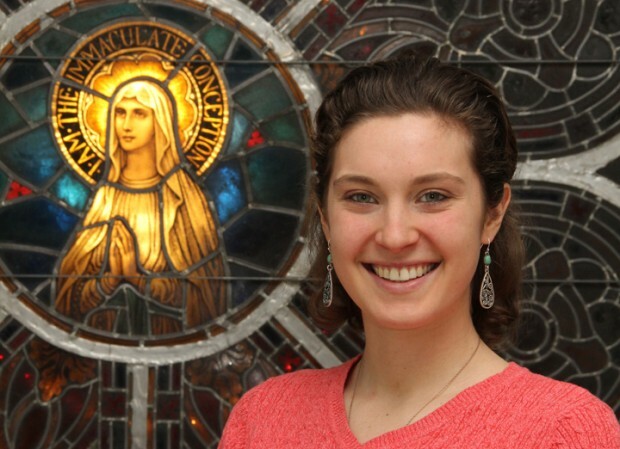 St. Vincent was willing to let her major in theology and it has been a perfect fit, especially with the school’s Benedictine philosophy which stresses community and hospitality, and love of Christ and neighbor. Along with service, Olivia’s family also instilled in her an appreciation for different cultures, through travels to such places as France, England, Spain, Croatia, Mexico and various islands. Timothy Sharkey well remembers his little daughter even as a toddler, making friends wherever they went. For example in rural France, without knowing a word of the language, going up to another child and starting to play. Her first service opportunity in college came when her faculty advisor, Dr. Timothy McMahon, arranged a service trip during spring break to Guatemala through International Samaritan, a Michigan-based organization that is active in areas of extreme poverty. Nothing she had ever previously experienced prepared her for the appalling living conditions she witnessed. The children who attended the school where the college students were sent to assist for a week literally lived on a huge garbage dump in shacks built from discarded scraps. The children assisted their families by gleaning any recyclables they could find in the dump. As a matter of fact International Samaritan had an early focus on the incredibly impoverished people who live on similar dumps near many Central American cities. Throughout her college years Olivia made similar trips to Guatemala, Nicaragua, China and Taiwan, and even spent an entire semester student teaching in a Guatemalan school. 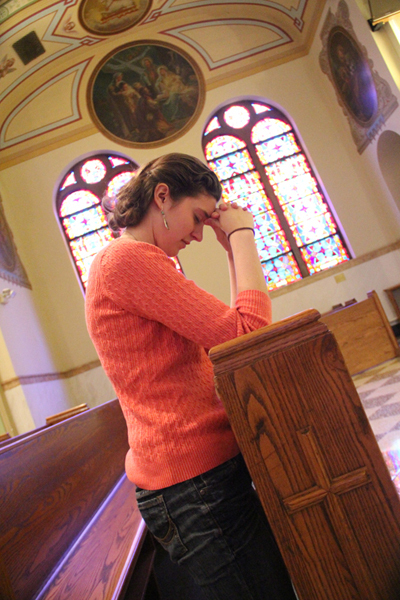 Through it all, “In my own life I began to see the face of Christ incarnate in so many individuals,” she said. It is not the same everywhere. In Central America what she encountered was physical poverty coupled with strong family life; the Far East was quite different. Olivia will graduate from St. Vincent’s in May. What then? She hopes to take a full year for volunteer service work, probably in this country, where there are also needs, even if not as dramatic as those in Central America. Her mentors at St. Vincent are counseling her to continue on with her education, certainly with a master’s degree and even a doctorate. An example McMahon gives is the ongoing “Banana Project” for the school where she taught in Guatemala. The children who come to the school often have little to eat, and what food they are given is not very nutritious. Money raised through the project is sent to the school so it can purchase bananas to supplement the children’s diet. Whatever Olivia does with the rest of her life, her parents will support her. This can be achieved through service projects, she is convinced, and in her own case she considers herself blessed. If you wish to contribute to Olivia’s Banana Project, send donations to St. Vincent Business Office, Guatemala Banana Project, 300 Fraser Purchase Rd., Latrobe, PA 15650.